The Broke and the Bookish : Kimberly Reviews Dark Mirror by M.J. Putney + Giveaway! Kimberly Reviews Dark Mirror by M.J. Putney + Giveaway! How I got it: From the publisher! Why I read it: The plot intrigued me, and when it was offered to me I took it! Ok, first of all. I really like the cover. I like the colors and the muted tone, and the image of the girl. Here is a plot summary that I stole from Goodreads. “Lady Victoria Mansfield, youngest daughter of the earl and countess of Fairmount, is destined for a charmed life. Soon she will be presented during the London season, where she can choose a mate worthy of her status. This book really pulled me into the story. I kept sneaking a page here and there while I was supposed to be working. (Shhh!) The book was completely new to me, as was the author, and yet there was something about the characters that made me feel like I was on the third or fourth book in a series. Within a few chapters I felt like I knew each of the characters, when they said or did things it just made sense. Everything the characters did felt natural to me.The story has plenty of twists and turns to keep the reader engrossed. I was NOT expecting some of the stuff that happened, but I liked it! However, there were a few points in the book where I felt like the characters accepted what was happening too easily. The ‘taint’ of magic and the way that some of the characters felt about it was a little too much, but at the same time the author needed to establish how people felt about magic early on, so it was important. It was just that occasionally I felt like saying “really? Did you really have to say it like that?” But more often than not I was too interested in what was happening to even notice stuff like that. Overall, a great read. It’s been a while since I’ve been so pulled into a book, I finished it in about a week. Considering that I’m taking 8 classes and working 40 hours a week, that’s a short amount of time for me! 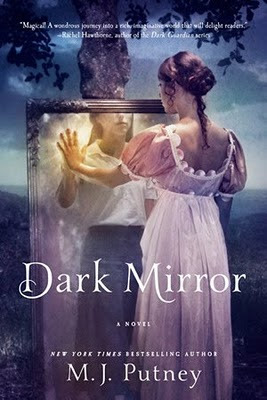 The publisher has kindly given us a copy of Dark Mirror to give away to one of you lovelies! Please leave a comment below with a way to get in contact with you (email, Twitter, blog, etc.). US only. This giveaway will end April 1st. I've read a lot about this book and it sound great! Thanks for the giveaway! Loved your review, the book sounds great! Thanks for the giveaway! Sounds interesting! Reminds me of A Great and Terrible Beauty. I've been wanting to read this one, thanks for the giveaway! I'd love to review this one! I've really wanted to read this book! Love the cover, and it looks really good. Thanks for the giveaway! This book looks so good! Can't wait to read it! I've been wanting to read this one for so time now it's on my TBR pile. I would love to be entered please and thank you. Dark Mirror sounds good. I've read her romance books and she's an good author. I'm adding this to my list, to see if I can find it at the library or the used bookstore. It really sounds right down my alley! Would Like to Enter to win this Book.. I loved the cover, too! Sounds like a good read. Hi Kimberly! I wanted this book so much, but you scooped it up before I could respond! I've been reading some great reviews of this one, including yours. Thanks for the chance! hi! i can't wait to read this one! I've heard such great things about this book! This book looks fantastic. Thank you for the opportunity to enter! This book sounds like a keeper, :)My 'to-read' list just got longer!